Irene graduated from The University of Cordoba (Spain). 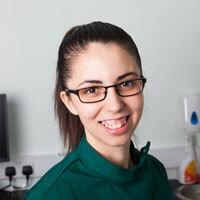 She worked in several practices across the UK and joined Abbey Vets in August 2017. She has interest in all aspects of small animal practice. Outside work she enjoys travelling and walking in the countryside.